Gary Ruvo's internet gallery of hand crafted stained glass hanging mobiles, sun catchers and authentic sea glass set in sterling silver. Sea glass pendants and glass mobiles. Original sea glass jewelry with authentic sea glass from the shoal of California and around the world. Handcrafted sterling silver jewelry and raised vessels. Hanging glass mobiles individually hand crafted from the finest reproduction Tiffany stained glass. 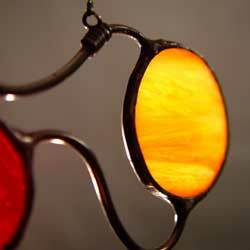 Stained Glass mobiles, art mobiles and hanging mobiles. Sea Glass Jewelry, my sea glass jewelry is individually hand crafted using sterling silver and other kinds of metal. I try to create each piece of sea glass jewelry in a simplistic yet chic form using a variety of fine jewelry fabrication techniques. 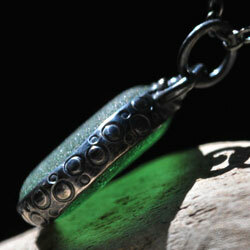 Many of my sea glass jewelry pieces have been forged, hand carved and engraved. Other pieces are made using the Lost Wax Casting technique. Many of these beautiful pieces of sea glass have been accented with semi-precious stones and gems. And most have been crafted with my backless bezel which allows the sea glass to glow wonderfully in the light and water. Sea Glass Jewelry and Sea Glass Pendants. Hanging Mobiles have marveled us throughout our lives. I've added a twist to hanging mobiles by combining the grace of Alexander Calder with the colorful vision of Louis Comfort Tiffany to create my stained glass mobiles. The glass mobiles featured here are individually handcrafted from the finest reproduction Tiffany stained glass fancy wire work and lead-free solder. Glass mobiles. 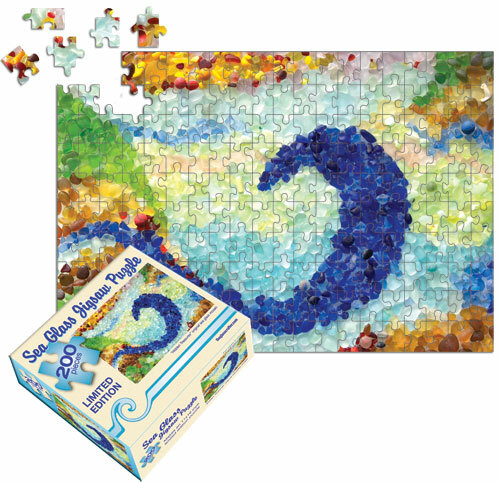 Thanks to all who purchased and played with our original Sea Glass Jigsaw Puzzle. Created, photographed and designed in theglasscrafter.com studio, this limited edition 200 piece game was perfect for those who love to find surprises. Sea glass marbles, and other goodies, are tucked inside the mosaic photo. This jigsaw puzzle's final size is 11x16 inches. Only 250 were printed, and they are all gone. We are working on a new mosaic picture and puzzle, and hoping to have some printed soon. Though our 2011 Sea Glass Calendar is sold out, there is still a chance to buy prints. For more information about the calendar, keep reading.